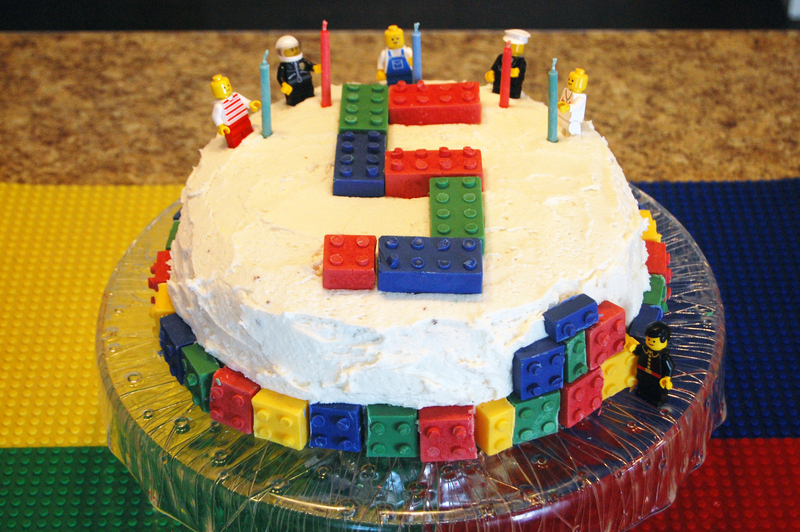 It’s hard to believe I’m posting my little man’s fifth birthday. We’ve come along way from our Little Peanut party. LEGOs…ahhh LEGOs. Timeless small land mines of colorful plastic that will occupy your typically boisterous child for hours on end. Parents rejoice! 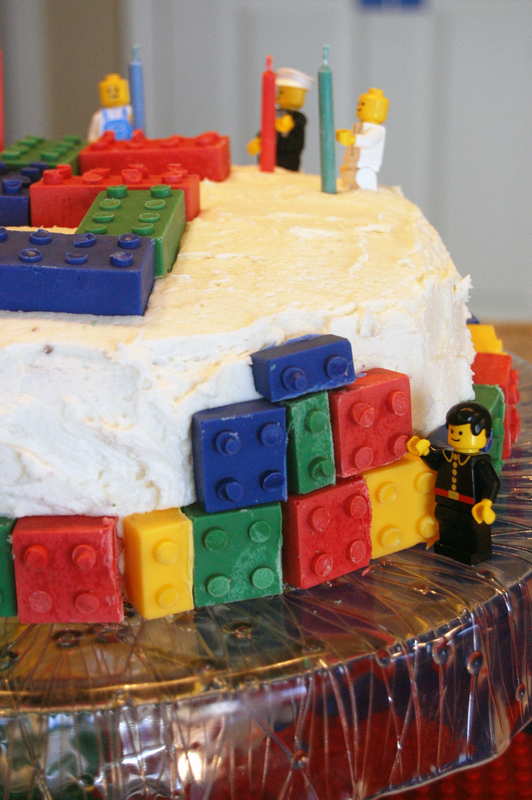 I was more than happy to oblige when Lincoln decided he wanted a LEGO birthday party. 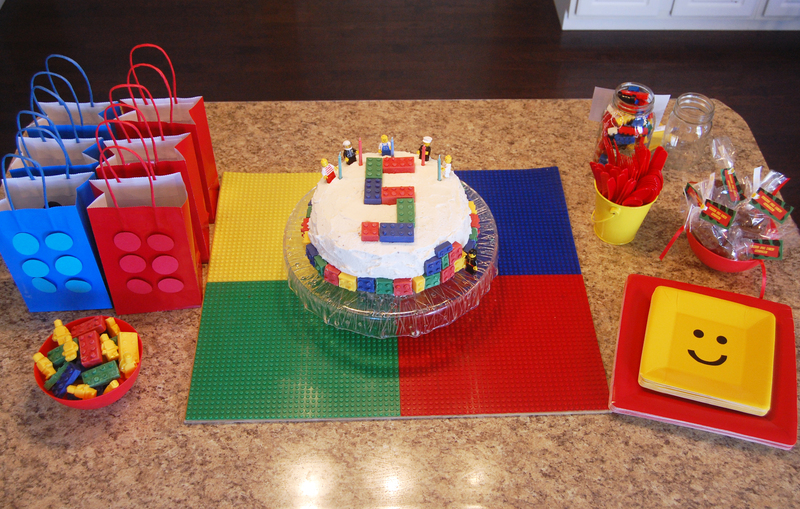 Fun, easy and colorful, there are so many options to create your very own LEGO party on a very limited budget. 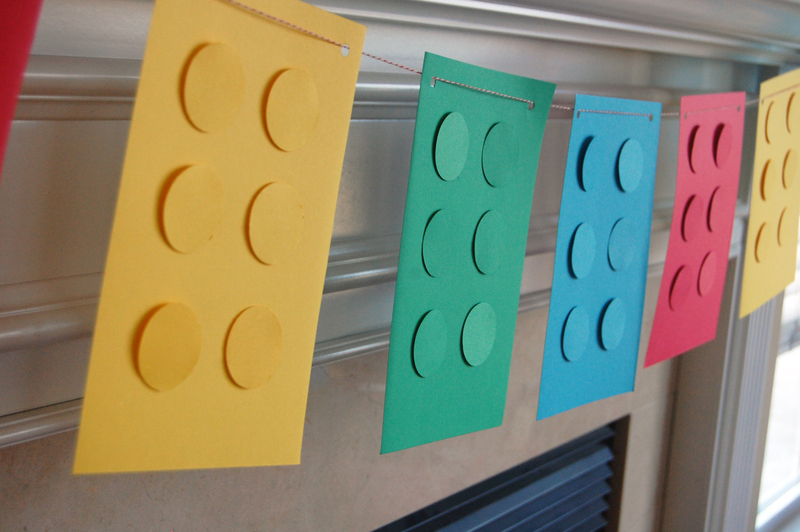 Many of the items were made by using a circular hole punch and foam squares to raise the circles off the paper. 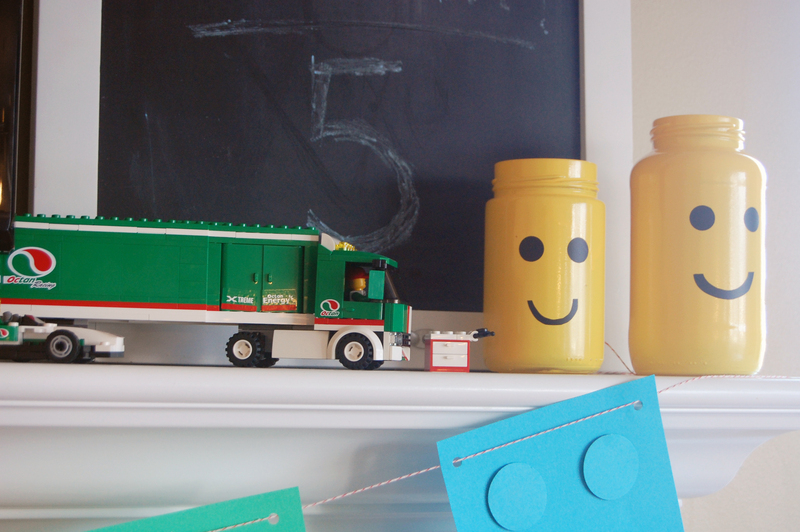 We utilized many of the LEGO items we have in our house for colorful accents! 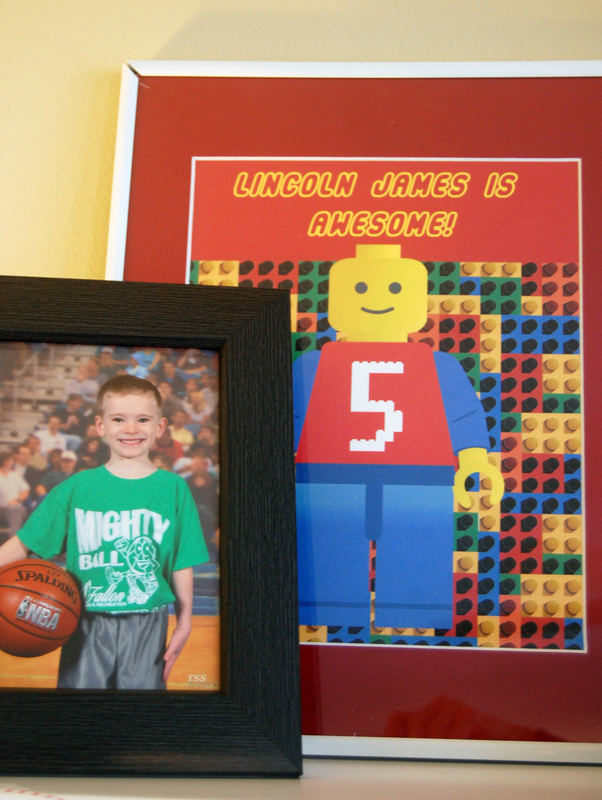 I created an invitation similar to this sign, which adorned our mantle along with a few other Lincoln and LEGO items. I painted pasta sauce and salsa jars using a yellow spray paint. 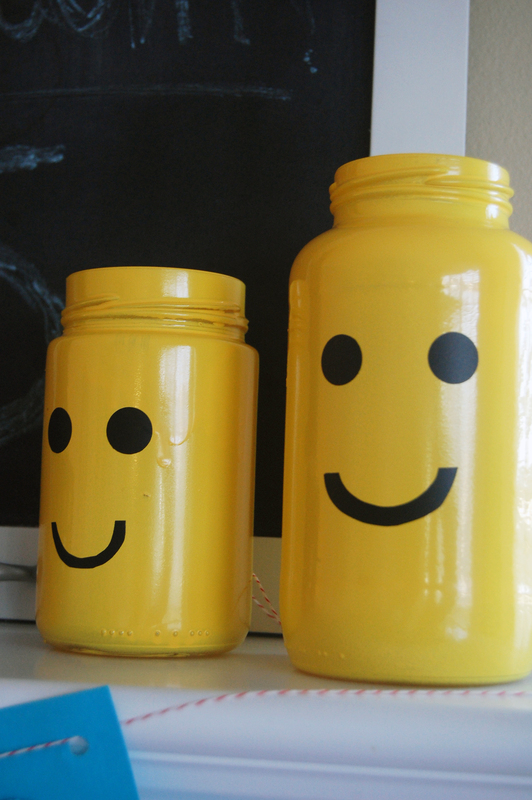 The face was made by punching out circles and cutting mouths from adhesive black paper, then sticking them to the jar. 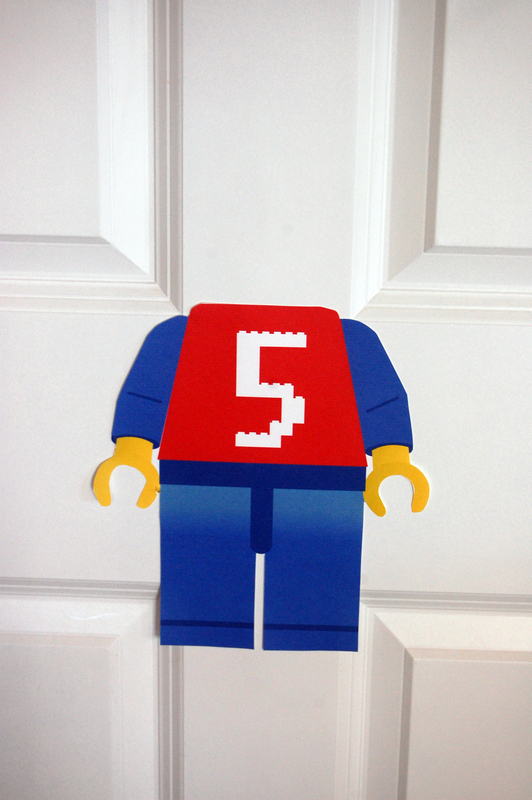 The kids all decorated LEGO man faces and played a rousing game of Pin the Head on the LEGO man! 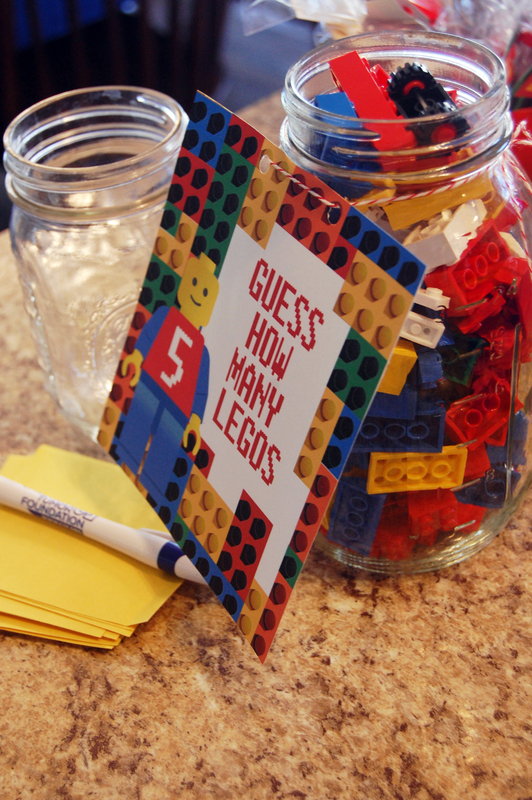 All of our party guests were asked to guess how many LEGOs were inside the jar. The winner won some birthday cake M&Ms! The cake was a homemade chocolate cake with buttercream frosting. 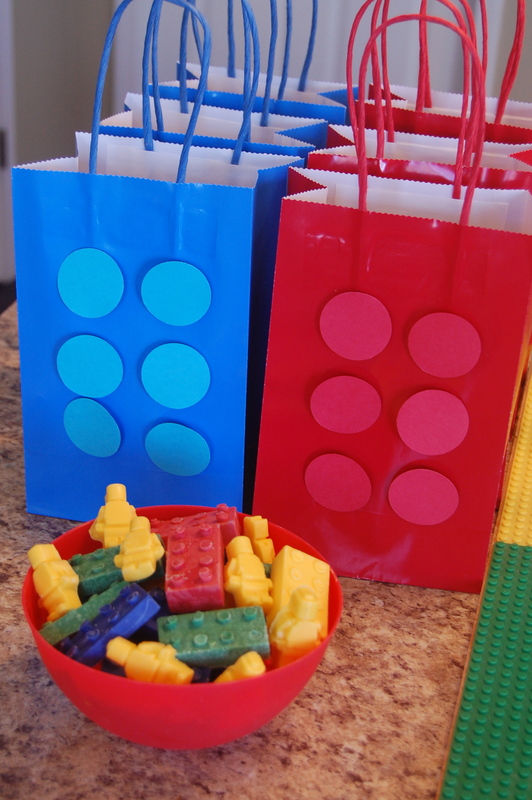 The “LEGOs” were candies made by melting candy melts and placing them in a LEGO block candy mold. 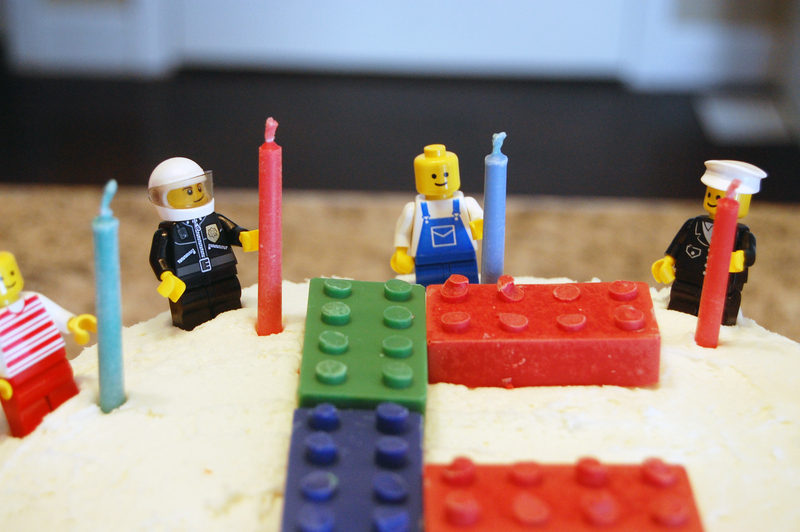 Some of Lincoln’s LEGO men made an appearance to help hold the candles for the birthday boy. 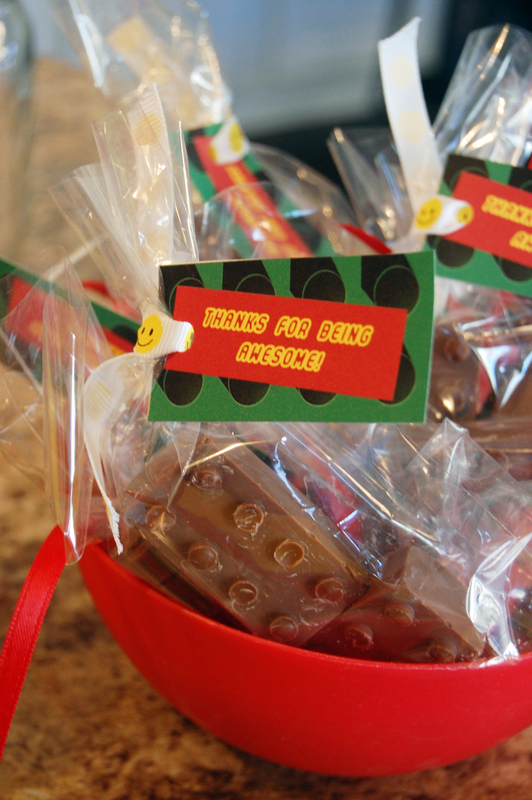 The treat bags were filled with small lego kits and chocolate lego candy favors. The grown ups also received some chocolate candy LEGOs as a parting gift. And for being awesome. 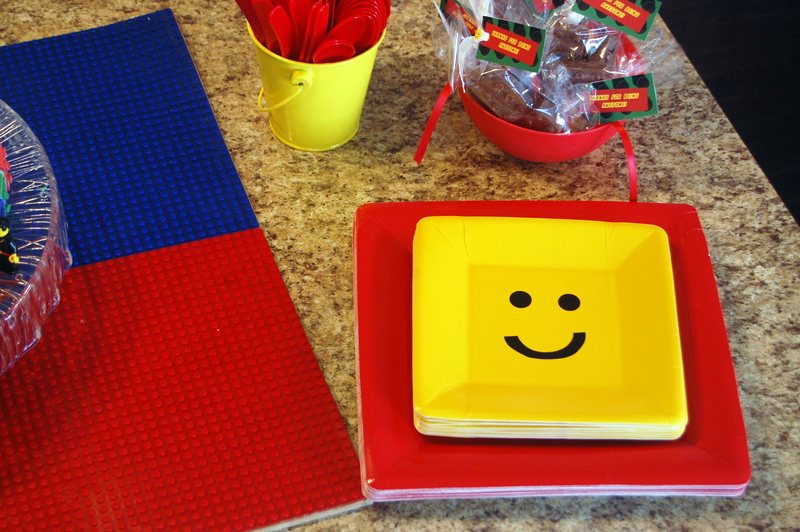 We purchased yellow square plates and used the same black adhesive paper from the pasta jar lego head to make a variety of faces. 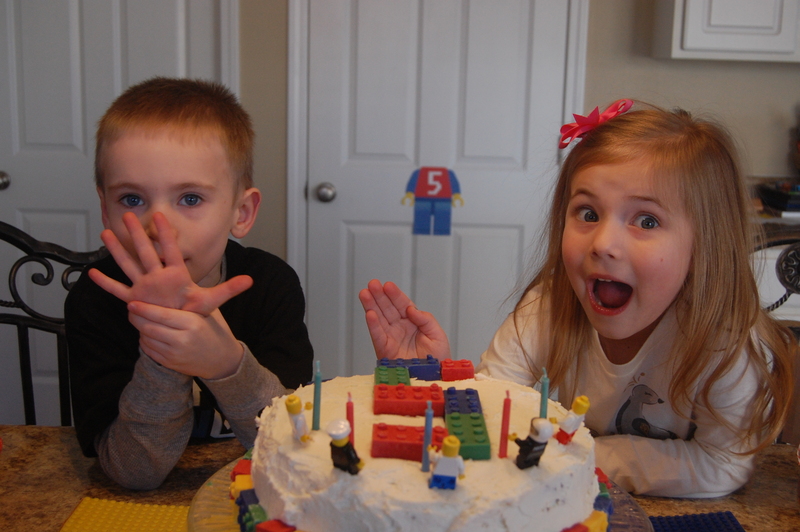 Our big five-year-old and his almost five-year-old cousin were very excited for the party! Happy birthday Lincoln! We think you’re awesome!